Washburn is about 9 miles south of Bayfield on Hwy 13. 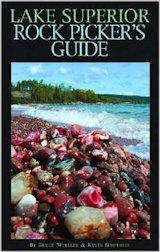 Washburn has two excellent campgrounds on Lake Superior, one at the south end and the other at the north end of town. 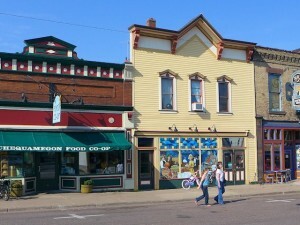 Midway between Ashland and Bayfield, it is a good central location for travelers wanting to spend a day or two in the area. 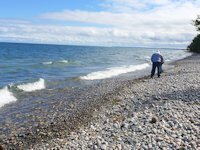 A nice round trip full day excursion from Washburn would take in Bayfield, Little Sand Bay, and Cornucopia and then return to Washburn via County C.
Municipal campgrounds & RV parks – north & south ends of town. North end better for tents, south end better for RVs. Clean, well maintained, lake views, showers, dump stations, reasonable price. Hugo’s Pizza Parlour – Great Pizza in log cabin atmosphere. Super 8 Motel. Lakeshore view, spacious parking, off the beaten path in nice neighborhood. Restaurant/steak house next door. Near lakewalk. One of Ashland’s many famous wall murals decorates this store netx to the Food Coop. 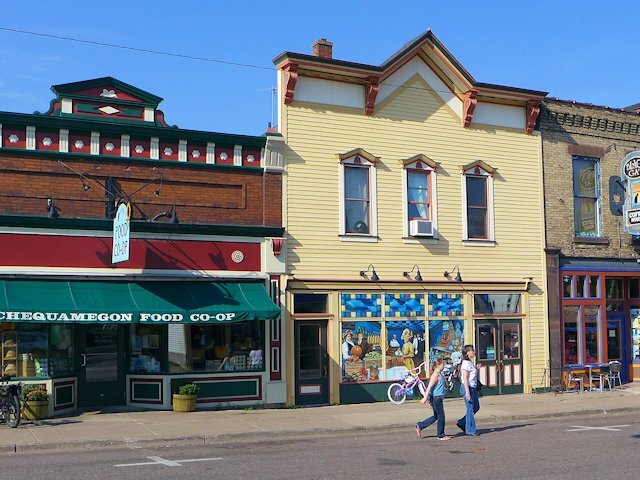 You can spend 1 – 6 hours in Ashland on the lakewalk & waterfront trail, downtown shopping, dining, nature trails, and the Northern Great Lakes Visitor Center (which is our recommended *Must See* and accounts for the lion’s share of the minimum of one hour to spend in the Ashland area). Also fill up your water bottles at the Artesian Well. Northern Great Lakes Visitor Center: interesting exhibits, bookstore and nature trails. It’s about 40 miles to Hurley from Ashland via US Hwy 2. Depending upon your schedule and interests, allot 50 minutes to 4 hours to arrive in Ashland. 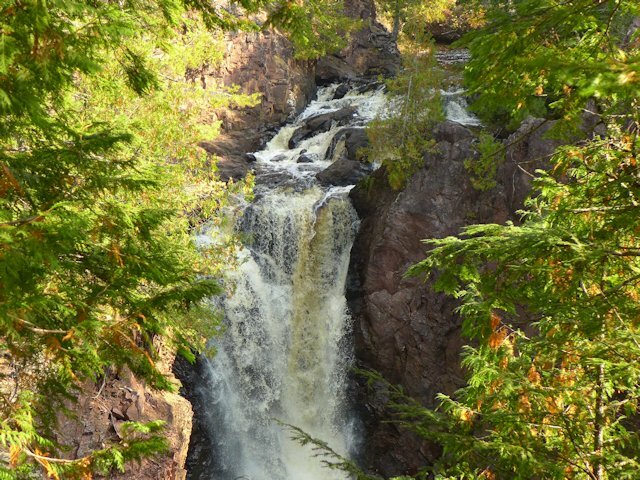 If you have an extra hour to spare, see Potato River Falls. From US 2 intersection with Hwy 169, go south a few miles through the berg of Gurney. At the south edge of town a sand-gravel road heads west to the falls park – about 2 miles. Rustic picnic area and hiking trails, viewing platforms to for both upper and lower falls. Then return to Hwy 2 and continue towards east towards Hurley. 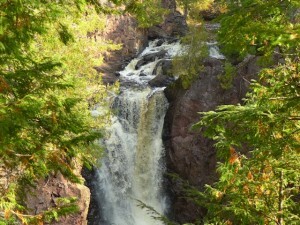 If you want more waterfalls and scenic hiking – and have the time – instead of taking US 2 East out of Ashland, take Highway 13 south to Mellen, Wisconsin and Copper Falls State Park. It is about 20 miles to the turn off to the park. The park offers hiking, views of 3 waterfalls, a swimming lake, and decent campsites. Unless you are staying over and camping, plan to spend at least an hour in the park seeing the falls. When leaving the park turn left on Highway 169 to go east and north. In about 15 miles you’ll encounter the turn-off to Potato Falls referenced above. Either stop to also visit Potato River Falls or continue driving until you intersect with US Hwy 2 and go east on Hwy 2 until you get to Ironwood, Michigan. If you are going directly from Ashland to Michigan, you might enjoy stopping at the Bad River Lodge and Casino at Odanah along US highway 2.